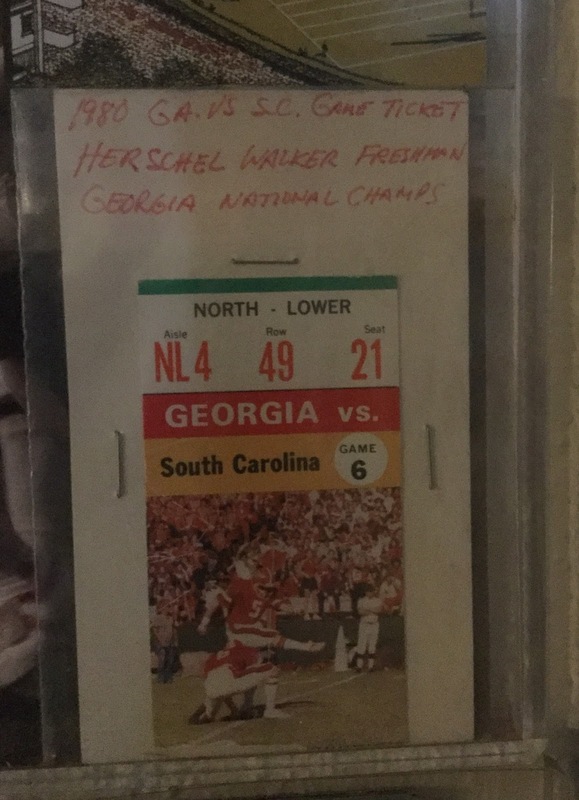 I have a few ticket stubs from Herschel Walker's college career at Georgia in my collection. Sadly, I didn't attend any of these games myself, but was able to acquire the stubs as a memento at a later date. 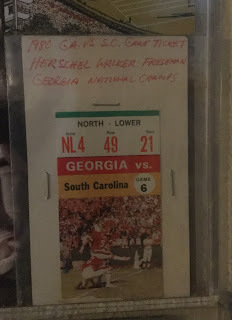 Here is one from the South Carolina vs Georgia game on November 1st, 1980. This game was one of the highlights of Walker's storied career at the University of Georgia. It was a match up between Herschel, the freshman sensation, and Heisman trophy front runner, George Rogers, South Carolina's feature running back. At the time, Rogers had a long streak of 100 yard rushing games going, while Walker, though having made a big splash as he burst onto the scene in the 1980 season, was figured by most to be not quite as good as the senior Gamecock running back. The score was very close, with the Georgia Bulldogs winning 13-10, but on the individual front, Herschel won the day. He carried the ball a then record 43 times, for 219 yards. George Rogers was able to keep his 100 yards per game streak alive, finishing with 168 on 35 carries, but his costly fumble late in the game erased any chance of a South Carolina comeback. The highlight of Herschel's day was a 76 yard scamper down the right sideline at Sanford Stadium. It is in the top three or four of his most legendary carries. Three South Carolina defenders had an angle to tackle him, but Herschel used his world class speed to outrun all of them for a touchdown. Herschel had been held down in the first half, and this play, which occurred early in the third quarter, was a real spark for the home team. 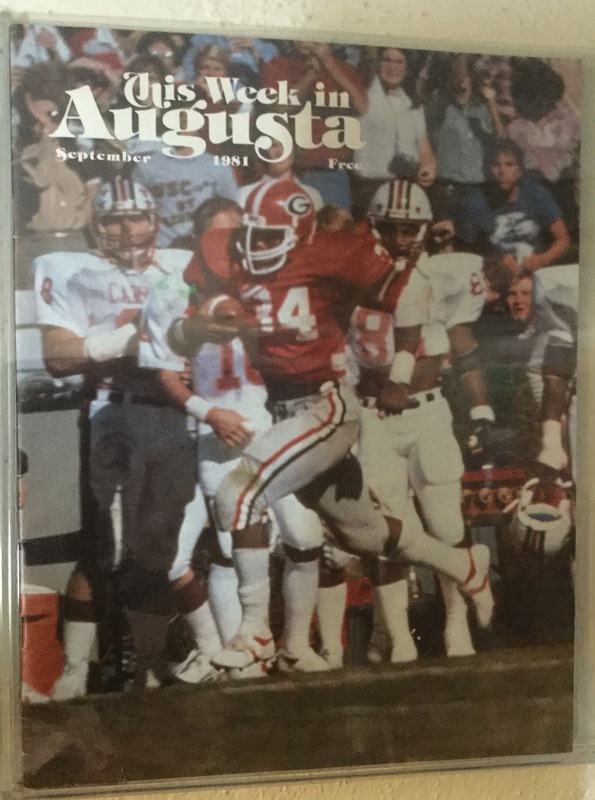 The September 1981 issue of "This Week in Augusta" magazine showed a photograph of the famous run on the cover. Here it is, depicting Walker streaking past a stunned Carolina sideline for a touchdown. Watch for another ticket stub, and the story of the game behind it, coming soon.